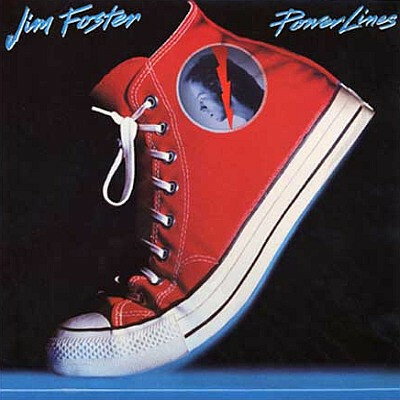 Until the release of the album Power Lines, Jim Foster had not been heard from for many years. It makes one wonder whether the Alberta-raised singer/songwriter/multi-instrumentalist is on somewhat of a comeback. “Well gosh,” says Foster. “How can you make a comeback when you were never there in the first place? But Foster, who appears with Mr. Mister at the Queen Elizabeth Theatre April 14, was once active in the rock marketplace–whether he can remember that far back or not. In 1977 his group Fosterchild released a self-titled debut album, a nifty piece of vinyl made strong through such Foster-penned tunes as “I Need Somebody Tonight”, “Are You Ready to Fly?”, and “Let Me Down Easy”. The LP sold 20,000 copies, a respectable number for a debut. That was followed by Troubled Child, which included the slinky single “It’s Too Late Now”. It went on to sell 35,000, and things were looking good for Foster. Before calling it quits, though, Fosterchild made a last-ditch effort to turn things around with a live album recorded in Edmonton. The LP, On the Prowl, didn’t help the band’s pocketbook and they moved out to Vancouver, playing clubs for a year to pay off debts. They got rid of half the crew and half the lights and P.A. With Foster running the band and driving the bus, they managed to pay things off by 1980. Then Foster started from scratch again. “I basically took a year off from doing much and grabbed an acoustic guitar and went a couple of weeks a month doing clubs, doing old blues and Elvis Presley Sun-collection stuff, and some Tom Waits. And then I started writing in the other two weeks of every month and submitting a few songs here and there. Foster then went back into Mushroom Studios to lay down Power Lines, utilizing his own production skills and those of Chilliwack’s Bill Henderson, Walter Stewart, and former Payola$ member Bob Rock. Bob Rock did co-production on the LP’s first single, “X-Ray Eyes”, and “Saved By Night”. Another ex-Payola$ member, Paul Hyde, came in during the mixdown of the latter tune to add background vocals. Loverboy drummer Matt Frenette also showed up to get a few licks in. Foster also had the cream of Vancouver’s studio musicians adding bits to his first solo album. Doug Edwards (Wildroot Orchestra) played bass on two cuts, Jim McGillivray (Skywalk, Wildroot) played percussion, David Woodward (Powder Blues) blew sax, and Dave Pickell (sessionist extraordinaire) handled keyboards. Some of the city’s top vocalists also lent their talents to Foster’s comeback. Lori Paul (ex of Dog Skin Suit and The Crooked Beat of Heaven, now with Science) did a number of background vocals, and Marc LaFrance (formerly with Crowcuss) added more. And there were others. “One day we bought a couple of bottles of wine and sat down and started phoning people to have a big sort of gang vocal on ‘Dancing on the Power Lines’. We had David Raven, and Sandi D. and Nancy Nash come in, and then we all congregated around a microphone and screamed ‘dance, dance, dancing on the powerlines’ for an hour or so. The powerhouse talent involved with Power Lines seems to have payed off–at least as far as North American radio programmers are concerned. “X-Ray Eyes” is receiving steady airplay in Canada and its video can be seen on MuchMusic. The second and better single, “Quicker Than the Eye”, has been playlisted throughout Texas, as well as in Seattle, Miami, and St. Louis. What Fosterchild was unable to achieve, Foster’s latest offspring has already won–U.S. airplay. And the icing is a 14-date tour with the highly popular Mr. Mister, which came about after the group’s agent heard a Jim Foster tape. His touring band includes bassist Jim Ryan, saxman/keyboardist Mike Skinner (from the R&B Allstars), keyboardist Rob Bailey (from the Rhythm Snakes), and drummer Daryl Burgess, who led those same Snakes to a second-place finish in the recent Spotlight 86 competition. With a strong band lined up, good management via Lou Blair, and dates with one of the hottest acts around, things are falling into place for Jim Foster.